Sebastopol Rotary loves to give away money. But to give, you have to get. And we do. In 2017-18, the club gave almost $250,000 in grants, scholarships, stipends, and donations to Rotary’s International efforts. 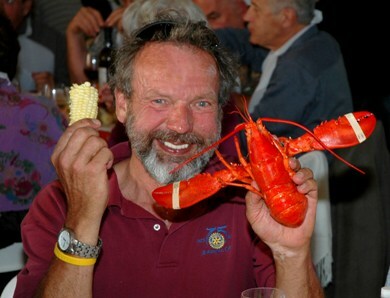 Much of that came from our two annual fundraisers, the Lobster Fest in the fall and the Crab Feed in February. The 2018 Crab Feed was a great success. We fed over 500 diners great crab with all the fixings and lots of good, local wine. We raised over $28,000 for our teacher grants. We look forward to continuing our great work in the fall. Raising that amount of money might be a burden in some organizations, but not for us. We enjoy putting on our events, just as we enjoy attending them. From planning the logistics of our meals, to hunting down gifts for silent and live auctions and setting up and breaking down our sites, we really get into what we do. It really is a treat to do this work. Over the years, we have changed the exact type of events we put on. We realize that even our most dedicated donors get tired of seeing, and eating, the same thing year after year. So, one of the joys of fundraising is constantly thinking up new and better strategies for generating more fun – and more money – from our next event. For example, in 2015, we held “Fantasmagoria,” a playful trip back to the ‘60s, with more tie-dyed clothes and ridiculous hair than one could possibly imagine. And at the 2017 fall event, a “Lobster Boil,” everyone (other than the lobsters, of course), had a great time eating a down-east dinner and listening to a Beatles cover band. If you’d like to see what we are like when we party, click here. What you’ll see in those pictures is people having fun. And, of course the more fun, the more people join in the live and silent auctions, which means more money for our good works. What you don’t see is how terrific the auction items are, and what you really don’t see is that those who set up the tables or cooked the lobsters are having as much fun as those who just came for a good meal and great music. Current Fundraisers: Crab Feed, Evening Gala. One hallmark of Sebastopol Rotary is that we like to do things together. We enjoy each other’s company. So, we party, picnic, golf, and fish with other club members during the course of the year. The list of annual events may not be endless, but it is really pretty long. We start the year with a Super Bowl party. That is immediately followed with a Valentine’s Day luncheon. Then, during the spring we have “Friendship Dinners,” where several club members host dinners for other club members, some of whom they know well and some of whom they’d like to know better. In June, there is the “debunking” of the out-going club president, where we gently (well, let’s just leave it at “gently”) roast our departing leader for all the good work he or she has done. And we spread our thoughts around, making sure our departing board knows what we think of them as well. Over the summer, there are a variety of events, including a picnic, a golf tournament, and a fishing trip. And, finally, as the year draws to a close, there is our holiday party. This year, for example, the summer season kicked off with a cocktail hour on a sunny Thursday evening at Russian River Vineyards. Each event is fun-filled, and every one is distinct. They are a time to enjoy the company of friends. One hallmark of Sebastopol Rotary is that we like to do things together. We enjoy each other’s company. So, we party, picnic, golf, and fish with other club members during the course of the year.